For other uses, see Refusenik (disambiguation). January 10, 1973. Soviet Jewish refuseniks demonstrate in front of the Ministry of Internal Affairs for the right to emigrate to Israel. 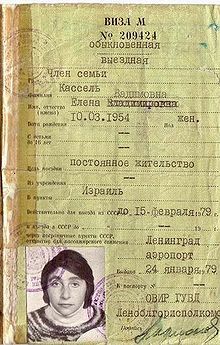 A type 2 USSR exit visa. This type of visa was issued to those who received permission to leave the USSR permanently and lost their Soviet citizenship. Many people who wanted to emigrate were unable to receive this kind of exit visa. Refusenik (Russian: отказник, otkaznik, from "отказ", otkaz "refusal") was an unofficial term for individuals, typically, but not exclusively, Soviet Jews, who were denied permission to emigrate, primarily to Israel, by the authorities of the Soviet Union and other countries of the Eastern bloc. The term refusenik is derived from the "refusal" handed down to a prospective emigrant from the Soviet authorities. Other ethnicities, such as Volga Germans attempting to leave for Germany, Armenians wanting to join their diaspora, and Greeks forcibly removed by Stalin from Crimea and other southern lands to Siberia. Members of persecuted religious groups, such as the Ukrainian Greek-Catholic Church, Baptists and other Protestant groups, Russian Mennonites, and Jehovah's Witnesses. A typical pretext to deny emigration was the real or the alleged association with state secrets. Applying for an exit visa was a step noted by the KGB, so that future career prospects, always uncertain for Soviet Jews, could be impaired. As a rule, Soviet dissidents and refuseniks were fired from their workplaces and denied employment according to their major specialty. As a result, they had to find a menial job, such as a street sweeper, or face imprisonment on charges of social parasitism. The ban on Jewish immigration to Israel was lifted in 1971 leading to the 1970s Soviet Union aliyah. The coming to power of Mikhail Gorbachev in the Soviet Union in the mid-1980s, and his policies of glasnost and perestroika, as well as a desire for better relations with the West, led to major changes, and most refuseniks were allowed to emigrate. Over time, "refusenik" has entered colloquial English for a person who refuses to do something, especially by way of protest. A large number of Soviet Jews applied for exit visas to leave the Soviet Union, especially in the period following the 1967 Six-Day War. While some were allowed to leave, many were refused permission to emigrate, either immediately or after their cases would languish for years in the OVIR (ОВиР, "Отдел Виз и Регистрации", "Otdel Viz i Registratsii", English: Office of Visas and Registration), the MVD (Soviet Ministry of Internal Affairs) department responsible for exit visas. In many instances, the reason given for denial was that these persons had been given access, at some point in their careers, to information vital to Soviet national security and could not now be allowed to leave. During the Cold War, Soviet Jews were thought to be a security liability or possible traitors. To apply for an exit visa, the applicants (and often their entire families) would have to quit their jobs, which in turn would make them vulnerable to charges of social parasitism, a criminal offense. Many Jews encountered systematic, institutional antisemitism which blocked their opportunities for advancement. Some government sectors were almost entirely off-limits to Jews. In addition, Soviet restrictions on religious education and expression prevented Jews from engaging in Jewish cultural and religious life. While these restrictions led many Jews to seek emigration, requesting an exit visa was itself seen as an act of betrayal by Soviet authorities. Thus, prospective emigrants requested permission to emigrate at great personal risk, knowing that an official refusal would often be accompanied by dismissal from work and other forms of social ostracism and economic pressure. At the same time, strong international condemnations caused the Soviet authorities to significantly increase the emigration quota. In the years 1960 through 1970, only 4,000 people (legally) emigrated from the USSR. In the following decade, the number rose to 250,000, to fall again by 1980. In 1970, a group of sixteen refuseniks (two of whom were non-Jewish), organized by dissident Eduard Kuznetsov (who already served a seven-year term in Soviet prisons), plotted to buy all the seats for the local flight Leningrad-Priozersk, under the guise of a trip to a wedding, on a small 12-seater aircraft Antonov An-2 (colloquially known as "кукурузник", kukuruznik), throw out the pilots before takeoff from an intermediate stop, and fly it to Sweden, knowing they faced a huge risk of being captured or shot down. One of the participants, Mark Dymshits, was a former military pilot. On 15 June 1970, after arriving at Smolnoye (later Rzhevka) Airport near Leningrad, the entire group of the "wedding guests" was arrested by the MVD. The accused were charged for high treason, punishable by the death sentence under Article 64 of the Penal code of the RSFSR. Mark Dymshits and Eduard Kuznetsov were sentenced to capital punishment but after international protests, it was appealed and replaced with 15 years of incarceration; Yosef Mendelevitch and Yuri Fedorov: 15 years; Aleksey Murzhenko: 14 years; Sylva Zalmanson (Kuznetsov's wife and the only woman on trial): 10 years; Arie (Leib) Knokh: 13 years; Anatoli Altmann: 12 years; Boris Penson: 10 years; Israel Zalmanson: 8 years; Wolf Zalmanson (brother of Sylva and Israel): 10 years; Mendel Bodnya: 4 years. The affair was followed by a crackdown on the Jewish and dissident movement throughout the USSR. Activists were arrested, makeshift centers for studying the Hebrew language and Torah were closed, and more trials followed. At the same time, strong international condemnations caused the Soviet authorities to significantly increase the emigration quota. In the years 1960 through 1970, only about 3,000 Soviet Jews had (legally) emigrated from the USSR; after the trial, in the period from 1971 to 1980 347,100 people received a visa to leave the USSR, 245,951 of them were Jews. Refuseniks included Jews who desired to emigrate on religious grounds, Jews seeking to immigrate to Israel for Zionist aspirations, and relatively secular Jews desiring to escape continuous state-sponsored antisemitism. A leading proponent and spokesman for the refusenik rights during the mid-1970s was Natan Sharansky. Sharansky's involvement with the Moscow Helsinki Group helped to establish the struggle for emigration rights within the greater context of the human rights movement in the USSR. His arrest on charges of espionage and treason and subsequent trial contributed to international support for the refusenik cause. Yuli Edelstein, one of the Soviet Union's most prominent refuseniks, who has served as Speaker of the Knesset (Israel's parliament) since 2013. On 18 October 1976, 13 Jewish refuseniks came to the Presidium of the Supreme Soviet to petition for explanations of denials of their right to emigrate from the USSR, as affirmed under the Helsinki Final Act. Failing to receive any answer, they assembled in the reception room of the Presidium on the following day. After a few hours of waiting, they were seized by agents of the militia, taken outside of the city limits and beaten. Two of them were kept in police custody. In the next week, following an unsuccessful meeting between the activists' leaders and the Soviet Minister of Internal Affairs, General Nikolay Shchelokov, these abuses of law inspired several demonstrations in the Soviet capital. 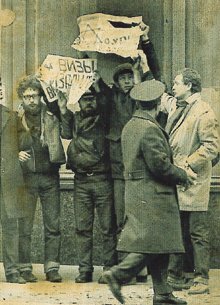 On Monday, 25 October 1976, 22 activists, including Mark Azbel, Felix Kandel, Alexander Lerner, Ida Nudel, Anatoly Shcharansky, Vladimir Slepak, and Michael Zeleny, were arrested in Moscow on their way to the next demonstration. They were convicted of hooliganism and incarcerated in the detention center Beryozka and other penitentiaries in and around Moscow. An unrelated party, artist Victor Motko, arrested in Dzerzhinsky Square, was detained along with the protesters in recognition of his prior attempts to emigrate from the USSR. These events were covered by several British and American journalists including David K. Shipler, Craig R. Whitney, and Christopher S. Wren. The October demonstrations and arrests coincided with the end of the 1976 United States presidential election. On October 25, U.S. Presidential candidate Jimmy Carter expressed his support of the protesters in a telegram sent to Scharansky, and urged the Soviet authorities to release them. (See Léopold Unger, Christian Jelen, Le grand retour, A. Michel 1977; Феликс Кандель, Зона отдыха, или Пятнадцать суток на размышление, Типография Ольшанский Лтд, Иерусалим, 1979; Феликс Кандель, Врата исхода нашего: Девять страниц истории, Effect Publications, Tel-Aviv, 1980.) On 9 November 1976, a week after Carter won the Presidential election, the Soviet authorities released all but two of the previously arrested protesters. Several more were subsequently rearrested and incarcerated or exiled to Siberia. On 1 June 1978, refuseniks Vladimir and Maria Slepak stood on the eighth story balcony of their apartment building. By then they had been denied permission to emigrate for over 8 years. Vladimir displayed a banner that read "Let us go to our son in Israel". His wife Maria held a banner that read "Visa for my son". Fellow refusenik and Helsinki activist Ida Nudel held a similar display on the balcony of her own apartment. They were all arrested and charged with malicious hooliganism in violation of Article 206.2 of the Penal Code of the Soviet Union. The Moscow Helsinki Group protested their arrests in circulars dated 5 and 15 June of that year. Vladimir Slepak and Ida Nudel were convicted of all charges. They served 5 and 4 years in Siberian exile. Operation Wedding: a documentary film by filmmaker Anat Zalmanson-Kuznetsov, about her parents story Sylva Zalmanson and Eduard Kuznetsov, leading characters of Dymshits–Kuznetsov hijacking affair—a daring escape attempt from the USSR in 1970 that kickstarted the Soviet Jewry movement. In 2008 filmmaker Laura Bialis released a documentary film, Refusenik, chronicling the human rights struggle of the Soviet refuseniks. ^ Crump, Thomas (2013). Brezhnev and the Decline of the Soviet Union. Routledge Studies in the History of Russia and Eastern Europe. Routledge. p. 153. ISBN 978-1-134-66922-6. ^ "Злоупотребления законодательством о труде" Archived 2015-05-02 at the Wayback Machine, a document of the Moscow Helsinki Group. ^ Oxford English Dictionary,(online). Oxford University Press. Retrieved 2012-06-08. ^ a b "Beyond the Pale: The Right to Emigrate II". www.friends-partners.org. ^ Benjamin Pinkus. The Jews of the Soviet Union: the history of a national minority. Cambridge University Press, January 1990. ISBN 978-0-521-38926-6; pp. 229-230. ^ Alexeyeva, Lyudmila (1992). История инакомыслия в СССР [The History of Dissident Movement in the USSR] (in Russian). Vilnius: Vest'. OCLC 489831449. ^ The Refusenik Project staff. "Historical Overview". The Refusenik Project. Retrieved 30 December 2018. ^ энциклопедии, Редакция (4 October 2018). "Советский Союз. Евреи в Советском Союзе в 1967–85 гг". Электронная еврейская энциклопедия ОРТ. Pauline Peretz, Let My People Go: The Transnational Politics of Soviet Jewish Emigration During the Cold War. Ethan Rundell, trans. Piscataway, NJ: Transaction Publishers, 2015. "Soviet repression of refusenik scientists unabated. The arrest of chemist Yuri Tarnopolsky points up the continuing plight of refusenik scientists in the Soviet Union under its new leadership". Chemical & Engineering News. 61 (20): 45–47. 15 May 1983. doi:10.1021/cen-v061n020.p045. Natan Sharansky, Fear No Evil: The Classic Memoir of One Man's Triumph over a Police State. ISBN 1-891620-02-9. Chaim Potok, Gates of November: Chronicles of the Slepak Family. ISBN 0-394-58867-3. Yuri Tarnopolsky, Memoirs of 1984. ISBN 0-8191-9198-1, ISBN 0-8191-9197-3. David Shrayer-Petrov (Russian: Шраер-Петров, Давид), Herbert and Nelly (a novel, in Russian, abridged 1986; complete 1992, 2006). A saga of a refusenik family set in Moscow in the 1980s. "Timeline of the Jewish Movement in the Soviet Union". Project for the Study of Dissidence and Samizdat. University of Toronto.